I suppose when you go to see a band you want them to sound really good like their records and you won't be disappointed because they sound great live. However if you are looking for a real lively exciting performance I am not sure Goat Girl deliver no interaction with the audience shame because they are a really good band and very professional but for me I would rather stay home and listen to their songs. Great performance by the band at a great venue. Staffed by great friendly staff. SHOCK HORROR !!!!! I really like Goat GIrl and saw them at Rough Trade in Nottingham and they were great. The gig i saw at the Cookie was a cancellation from April. I thought they were just going through the formalities of just another gig. I know they work hard travelling around and performing and were either partly tired or fed up with doing the same songs. This was the perception i got having seen them back in April. The cookie as a venue was great and the support act Rebel were different LOL but really like them. the band sounded good but the whole performance was a little lacklustre. almost as if they couldn't really be bothered to be there. the support act, rebel, was very cool though and somewhat made up for it. We have been very excited about the rise of Goat Girl. They had already announced shows at The Garage in London and The Cookie at Leicester in April. With the release of their eponymously titled debut album this month, the have now given us details of a tour in promotion of the new material which takes them to Manchester Gorilla, The Bodega at Nottingham, Bristol Thekla and Wedgewood Rooms in Portsmouth during October 2018. This summer, you will also see them make appearances at Citadel and Truck Festival. We are incredibly excited to be able to offer you Goat Girl tickets, but we must also make you aware that the demand is sky high so you will have to book yours before they are all snatched up. Fortunately, placing an order for the very best gig tickets is made easy with Gigantic as you can access our site from the comfort of your home or whilst busy and on the go using a computer, smartphone or tablet. 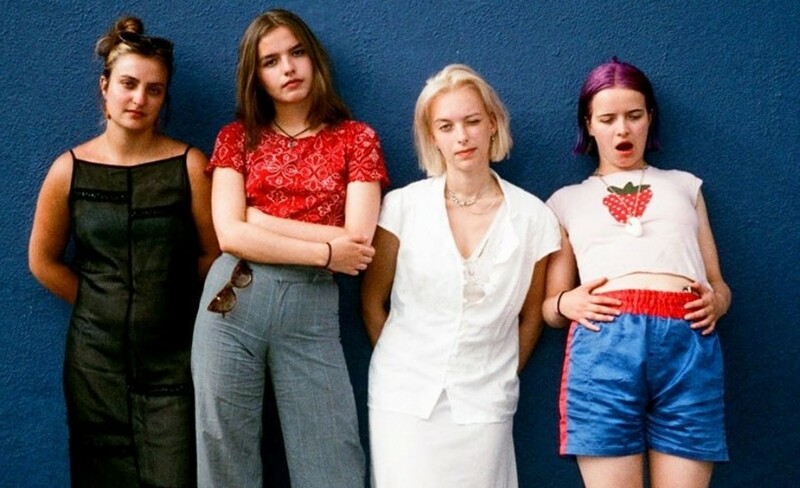 Goat Girl belong to a burgeoning, close-knit south London scene, born in venues like The Windmill and including bands like Shame, Bat-Bike, Fat White Family, Horsey, Sorry, and many more. “We help each other - I put you on, you put me on - because we genuinely like each other's music. We'd played gigs all over before but never really settled in a comfortable environment, which is what The Windmill is. It's an important place for us, it was the first space that our music made sense to exist within. It's a safe space where music is genuinely listened to and appreciated, and where laws and licensing haven't reached over to ruin the venue." “We wanted it to have a similar expression to our live sets and so knew from the start that a tape-based approach would work for us. There's less awareness of trying to achieve perfection as you can't edit out mistakes and so you allow them to occur instead. It felt like a really relaxed and natural environment, and you can hear the comfortability in the energy of our sound." Fans will need to book their Goat Girl concert tickets early as there are only limited amounts being put on sale by the event organisers - so book yours before they all go! Gigantic has taken home Nottingham Post illustrious ‘Retail Business of the Year 2017’ award for providing excellent customer service on a wide range of essential gig tickets, so you can be sure we are the very best place to come whenever you are planning your big night out. Why are Goat Girl not bigger? Goat Girl performed at Handmade 2017.